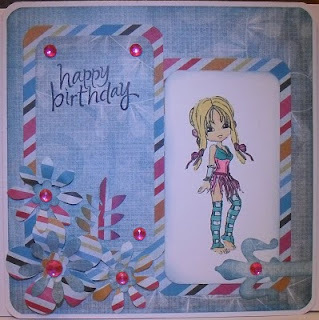 Crafting When I Can: My first DT card for Cowgirl Sunday Challenge. At last I can tell you my news. As you may have seen if you follow my blog regularly I often enter the Cowgirl Up Challenge. Well, the other day I was asked if I would like to be on their Design Team. The team has had to expand because they have gone weekly with their challenges and have more sponsors and so the number of entries has gone up. I had the great honour of being asked to join Posse 1 at the Cowgirl's Sunday Stamp'en Challenge. I hope that everyone who visits me will hop over and join in this fast growing challenge. You don't have to use a Cowgirl image but it would be fabulous if you did. We have a fantastic winners prize every week from images to ribbons and the winner will always get Cowgirl images no matter who is sponsoring the challenge that week. I have used a great image designed by CJ called CHRISTY if you click the name it will take you to the image. Hop on over to the store and have a look at the wonderful images there you won't be disappointed, there is something for everyone. I have used DCWV 12 x 12 stack 6 papers. A great digi image by CJ from Cowgirl Up Digital Stamps, various Woodware & EK punches to make the flowers and gems from stash. Our sponsor this week is Prairie Fairy Designs. You will be a Guest Designer for the whole of August. There will also be 3 x TOP 3 cards and these will be awarded a TOP 3 badge to display on their blog. Hop over to the challenge and join in the fun you won't regret it and you may be lucky enough to win the great prizes on offer. oh my busy popet, what a wonderful and lovely image!!! you made sooo nice colors! and the flowers look great!! Wonderful flower power card! Thanks for joining us at YNS! WOW Poppet huge congratulations to you hunni your cards are lush tho so its no wonder you were invited on the DT. I love this card & the image is coloured in beautifully. I've never been on this challenge blog I think I will have to have a peekskie. Sorry I've not been over for a few days I've had my dads Memorium this week & I've been ill for the last 3 days, I still am but I'm getting withdrawal symptoms now lol. Enjoy whats left of your weekend hun.